Recently I needed some sort of probe to reliably stick onto a tiny .5mm pitch IC pins. My scope probe was a bit unwieldy for that. Not sharp enough either. And so I came up with this probe from a tiny insulin syringe. It is extremely sharp, so it’s really easy to pierce through oxidation coating or even through a solder mask. First I drilled a small .5mm hole near the base of the needle. Then the piece of stripped twisted pair cable went through. Also I soldered a small piece of coax cable to a standard 0.1 inch pins. I used coax cable here, because the wire that goes through syringe would act like a big antenna, which I don’t really want. And, yes, I know the needle is pretty long, but at least that piece of coax would make things a little bit better. Just an additional shielding. 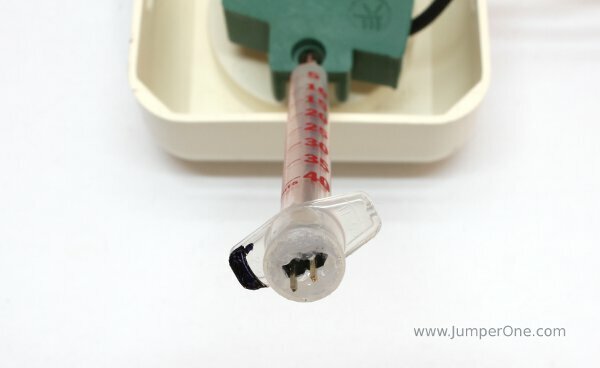 Then I soldered one side of coax to the solid core copper wire and passed it all through the syringe, so that connector would stick out at the top. I soldered only the central core of the coax cable, and chopped the screen at the end. Then carefully wound wire onto the needle. Reasonably high amount of wounds, so that it would make a good contact even if copper a bit oxidized. It’s a bummer that you can’t solder copper to a stainless steel.. Finally used some hot glue to hold connector in place and also marked shield terminal with black sharpie. Be careful, needles are extremely sharp! Do not pierce your hand!